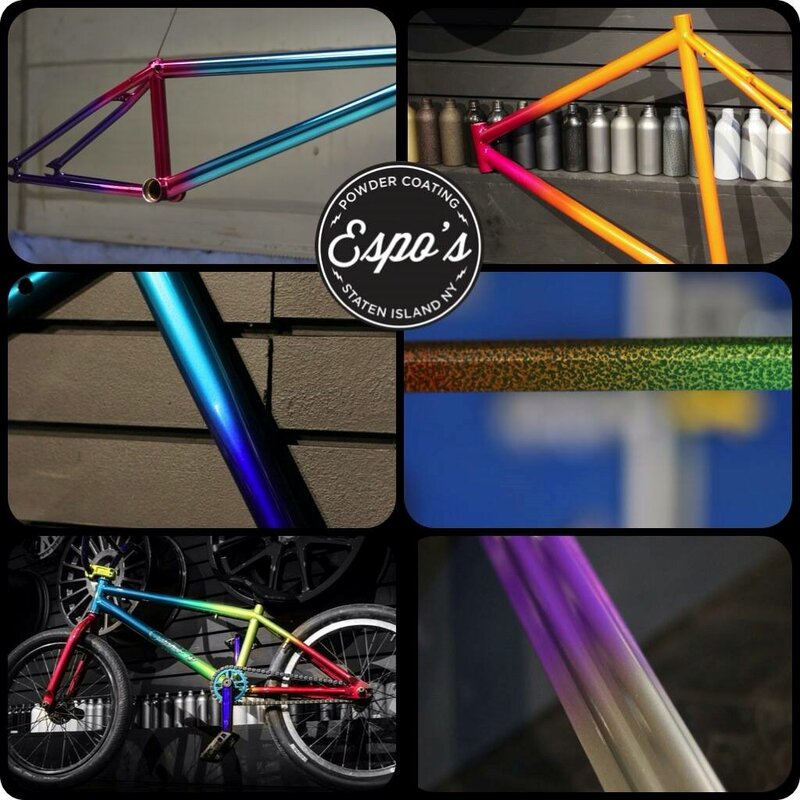 Examples of powder coating special effects, provided by Espo’s Powder Coating. As you know, powder can give you a more vibrant finish that lasts longer than traditional wet paint, and now it can rival wet paint’s ability to create jaw-dropping special effects. Many people, including coaters who have worked exclusively in a production environment, are sometimes unfamiliar with the effects that can be achieved with powder coating. In this article we’ll discuss some of the amazing powder coating special effects you can achieve with today’s powder coating technology. While powder coating special effects are similar to wet paint, there are some key process differences between the two applications. Wet painters frequently use multiple layers of paint that are combined to create depth and brilliance. Liquid painters also use products that have specialized metallic or mica pigments to reflect light. These products can be applied in separate coating steps to create a custom look. Powder coating special effects works in a similar fashion, but you have to cure, or at least partially cure, each powder layer before applying the next coat to achieve the correct results when attempting process special effects. Although this can be time consuming, you can get amazing results from multi-step effects like candy-coats and two-tone finishes. Like certain wet paint products, there are powders that can create one-step special effects. Popular one-step effects include river textures, wrinkle textures, hammer-tone, veining, glimmer, and even holographic finishes. These one-step finishes just need to be applied carefully and evenly to your metal surface and then cured per the suppliers’ recommendations. A process special effect is a special powder coated finish that can only be applied with multiple powder applications and curing steps. This includes candy colors and two-tone finishes. Candy Colors, also known as candies: These products create finishes that have incredible depth and usually provide bright, dramatic colors. They are typically applied in 3 steps: a metallic primer provides the background, then a transparent but colored base coat is applied, and then a clear gloss topcoat completes the effect. Each coat is cured individually. The final clear is not always required, but will add durability and protection for exterior parts. Two-Tone Finishes, also known as bi-tone or cut color: A two-color finish that requires masking, and requires skill and patience to achieve the desired result. Masking a powder effect is challenging and you need to use high temperature tape in order to keep a clean line between colors. Using two colors that are intense and dramatically different will give you the best results because the second color coat usually has to cover the first coat. It can be done with some transparent coatings, but you will have to carefully plan your finish order. Like with anything you powder coat, doing small test pieces is always recommended before finishing large production pieces. TIP: When removing high-temp masking tape, try to do it when the part is around 180° to 200°F. If you wait until it’s cooled down to room temperature it can leave flakes. If you pull it too early and the part is still near curing temperature it can pull strings of applied powder off of the surface of the part. A hand-held heat gun and a good quality IR thermometer (temp gun) can help with this custom technique by heating the part if it gets too cool and preventing damage to the finish. As opposed to process effects, one-step effects are sprayed and cured just like conventional powder. All major powder manufacturers have special effect finishes that can be sprayed on in one step and then cured. The most common powder coating special effects are those that create textured finishes. Wrinkle and river are some of the terms used to describe the visual effects these powders create. It is important to note that these powders must be mixed consistently to achieve consistent results. Conventional vibratory box guns are not as effective as hopper style guns that feature hoppers with fluidizing membranes. These hoppers constantly mix the powder with air, while vibratory box-fed guns may separate the heavier particles from the lighter ones due to agitation (think of the way gold panning works). Light textures usually work fine, but the heavier veining effect powders with multiple metallic or mica flakes can give disappointing results when sprayed from a box hooked to a vibratory gun system. Vein/River Texture: Vein textures are quite dramatic and can give a unique look to your parts. They are often used for electronic enclosures, interior industrial applications, and many interior furniture components. Be careful selecting a vein for an outdoor application. Because of the nature of the veined powder, it can cause different finish thicknesses across the part and may compromise the salt-spray durability of the powder. Unless a texture effect powder product specifically states that it is for outside use, consider it as interior-use only. Metallics: True metallics come in two qualities: bonded and unbonded. Bonded metallics have a little bit of clear powder attached to the metallic powder particles and may be suitable for one-step interior applications. Unbonded metallics need to be coated again with a clear topcoat to protect the metallic particles from oxidization. Some bonded metallics also need an extra clear coat for exterior durability. TIP: Metallic effect powders sometimes need different gun settings due to their conductivity. If you get weird patterns when spraying metallics, turn down your kV setting to the 20 to 40 range and see if that helps. Micas: These specialty powders create finishes that look similar to metallics but are more pearlescent or opaque. They can be used on interior or exterior parts and are typically cheaper than the bonded metallic effect powders. Hammer-Tones: These powders usually combine the river effects with pearlescent mica pigments. Consistent film thickness is important to maintaining a consistent hammered finish appearance. As you can see, powder coated finishes can offer impressive custom looks. Modern powders can produce a wide range of special effects that can take your project to the next level. 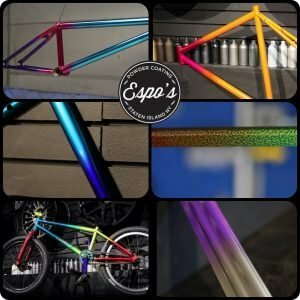 Have you used any of these powder coating special effects before? Especially proud of your work? Even if you don’t use equipment from Reliant Finishing Systems, send your pics to info@reliantfinishingsystems.com so we can share your work with others who have an interest in powder effects. This entry was posted in News on April 7, 2016 by Bruce Chirrey. Reliant Finishing Systems Applications Specialist Bruce Chirrey has been in the industrial finishing industry for 25 years. He has held positions such as Field Technical Service, Applications Lab Manager, and Technical Sales Representative. For the past 15 years he has been instrumental in the implementation of several finishing lines, both liquid and powder, for such industrial clients as Kubota, John Deere, Masonite, Kelley Manufacturing, Albany Marine Base, and many others. Welcome to BoothsandOvens.com’s Tips & Tricks! Reliant Finishing Systems is America’s fastest growing powder coating equipment manufacturer, offering high-performance professional equipment without the premium price tag. Reliant coating systems deliver incredible performance at prices that compete with many entry-level products. Apply for a Lease Today!